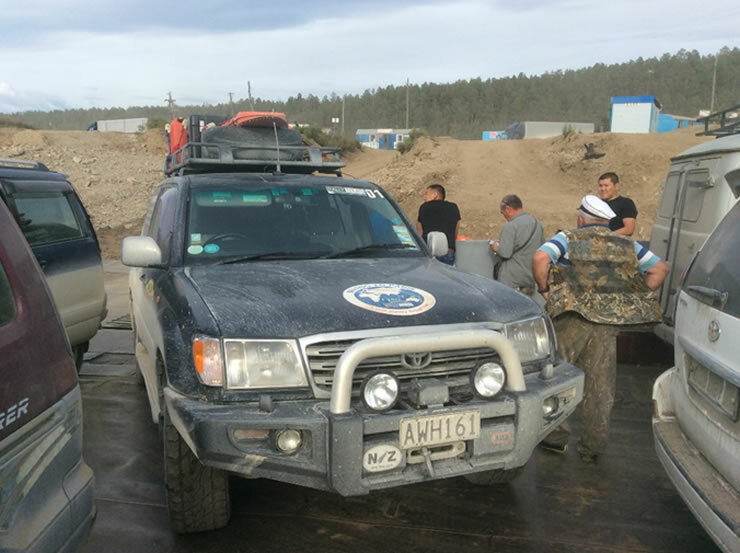 Overland Journeys’ (Rally Tours NZ Ltd) is the first NZ driving tour organisation to make the epic the “Road of Bones” drive in a 4×4 reaching the remote Far Eastern Russian city of Magadan. 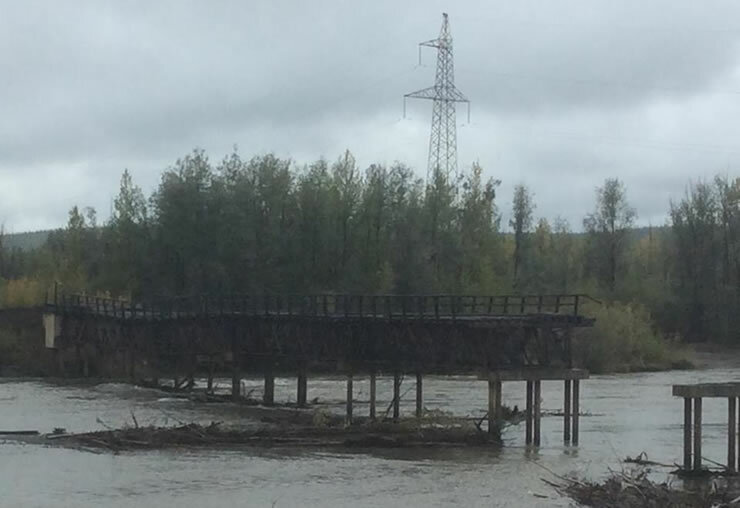 After quite a few years planning and accumulating experience of operating on the Russian continent, including the far-east regions it was decided to experience the infamous “Road of Bones” which is 3177 km north east of the main Trans-Siberian rail link to Vladivostok. 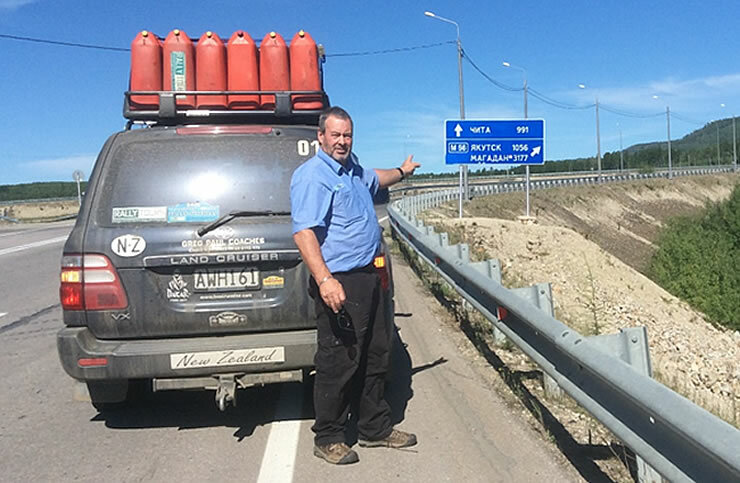 Our first target was the city of Yakutsk a mere 1250km to the North. Yakutsk is isolated by distance from any close civilisations and is rich with diamond and gold deposits as well as their own interesting Yakutian culture, which has a remarkable resemblance to that of the North American Indians. 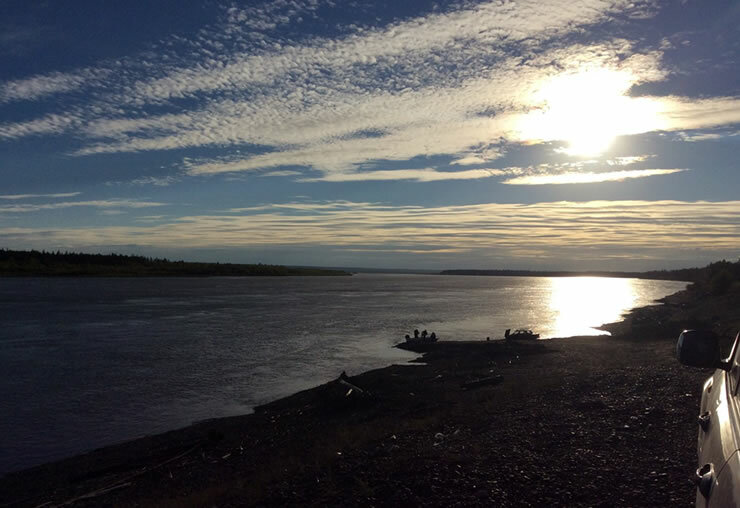 To get to Yakutsk involves an interesting ferry journey on the “Lena” river so warranted a 2 night stop to discover the delights of the fascinating place. The 2051km driving challenge from Yakutsk to Magadan on the “Road of Bones” began on Thursday the 18th with the return ferry crossing back to the M56 and we were not about to be disappointed with the driving challenges of the next few days !! 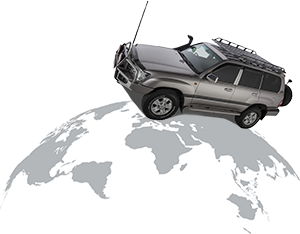 This is a fact finding mission for a tour to be operated next year, at the same time to Magadan by Overland Journeys. Finding suitable accommodation, food supplies, checking out achievable travelling distances and looking for off-route places of interests for our future tours is what I was here to do on this occasion. Without the help of Olga Antonova our Russian Travel agent from Novosibirsk, this would have been extremely difficult. As you can imagine absolutely nobody speaks English in this part of the world. We met up with two groups of motorcyclists both envious with the fact that we were travelling in the comfort of a warm dry Land Cruiser and we were not covered in the black slimy mud that turns to a creamy slush when wet, which is most of the time !! Accommodation is clean and comfortable The smooth fast slushy black coal dust roads It’s a bit like a trip back into history, into the secret Soviet times to be precise. It’s very different to the rest of Russia, as time has not moved although prosperity of a different type in a different era is very evident with lots of derelict buildings and in an abandoned city which we had a drive through….Interesting indeed and I have some firm theories as to why its inhabitants left in a hurry?? The drive is spectacular. The scenery is varying, vast and unfortunately being exploited for gold mining, but what else is this vast and baron land useful for? It is rich in both Gold and Diamonds but takes a special people to endure the harsh and long winters. Magadan, the civilisation at the end of the one-way road is a vibrant and multi-cultural city reliant on the Kolyma Highway to bring in the majority of its supplies. The truckies that run this road throughout the year are real drivers with real skills…and we saw a few that had run out of either luck of skill on a few occasions. 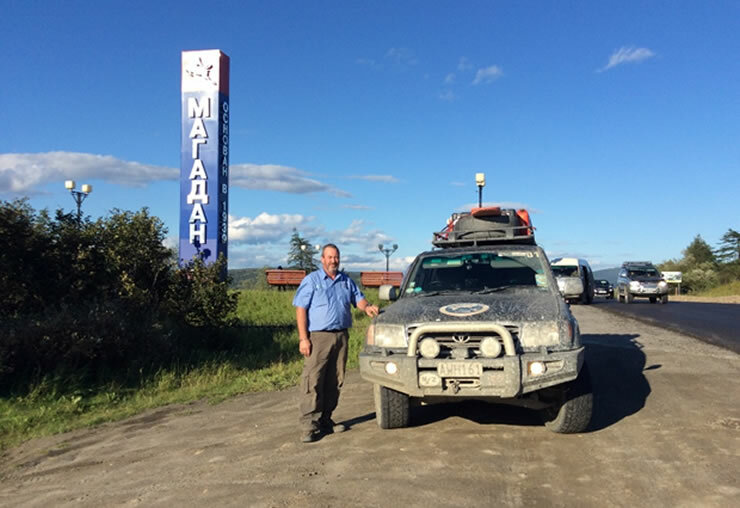 Overland Journeys arrived here in Magadan yesterday at 18.00 on the 21st August. 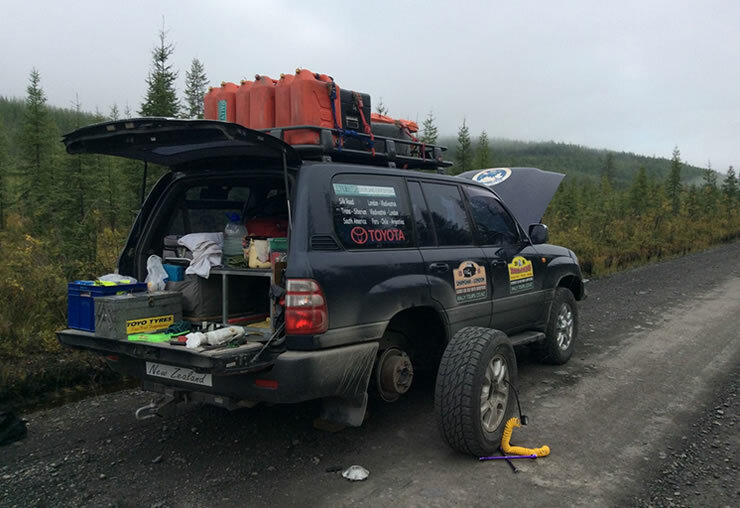 Today we continue to investigate tour opportunities, hotels etc in preparation for our commercial 4×4 tour to Magadan next year at precisely the same time….Join us on the expedition if you want an experience of a life time!! It’s a beautiful sunny day here in Magadan and about 12 degrees. 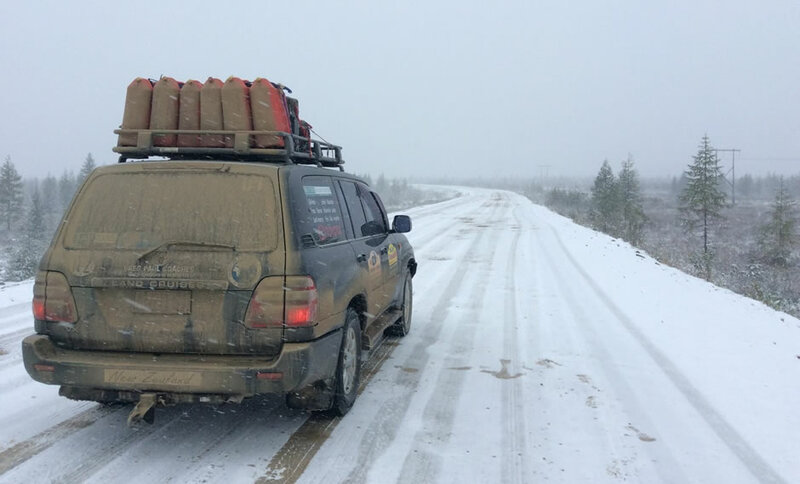 In two days Greg will drive the road again in the reverse direction to reposition the Land Cruiser to Vladivostok in preparation for shipping to Chile for the Dakar Rally in January. If you would like to know more about this tour, which will be 2017, please contact greg@rallytours.co.nz or deb@rallytours.co.nz we look forward to hearing from you.